Several trends within organizations have emerged to drive the innovation process, constantly attempting to improve a brand that will reach efficient and effective results. 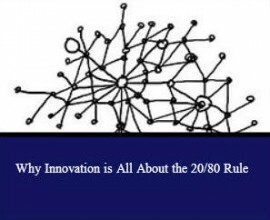 However several of these organizations are following the 80/20 rule, not the 20/80 rule for innovation, which ultimately leads to greater success. Like all successful and growing brands, organizations are continuing to focus on providing high-quality products. However in today’s age there is more to being the best in the business than highlighting your name in bold print on a book. The competition of being the best brand out there is significantly intense, and with the advancements of outsourcing there is an increased level of stress that constantly pushes brands to improve their organization everyday. Knowing how to implement the 20/80 rule of innovation will carry the success of organizations, and expand their opportunities. Innovation:The application of better solutions that meet new requirements, inarticulated needs, or existing market needs. Often times innovation is a topic that is found most interesting to a brand or organization needing change, and with the demand for stronger results to surpass the risks involved. These risks include businesses failing and the constant threat of losing ground to competitors, losing key staff, or simply operating inefficiently. Even though brands will have their own ideas, their own goals and their own mindset, each company is striving for more excellence everyday by constantly polishing up on their organization to make bigger and better improvements over their competition. To express the difference from an invention to innovation, the CBS News website offers a few examples of well-known businessmen who have greatly succeeded through innovation. Steve Jobs didn’t invent the GUI or the computer mouse, but when he saw them demonstrated, his mind was probably racing with practical applications. Howard Schultz didn’t invent coffee, espresso, or cappuccino, but he has certainly been an innovator in bringing all that to the masses through Starbucks. Bill Gates didn’t invent the PC operating system and he certainly didn’t come up with the idea of licensing technology, but his business model – combining the two – made Microsoft one of the most valuable and powerful companies in the world. Experts reveal that innovation happens from the outside in – the industry already exists, you’re just tweaking it to make it better, offering more to a product or service using your brand. In an article from Inc, these experts calim that you can’t innovate from the center of the firm, rather you have to start at the outer edge and work your way in. In a recent interview on the Speaking of Wealth Show Jeff DeGraff, a professor who works extensively in teaching innovation shared his expert opinion on innovation, coming right from his book Making Stone Soup: How to Jumpstart Innovation Teams. In this interview Jeff reveals how innovation can help you succeed in your business venture and that you should focus on something that works, not focusing your time or energy trying to fix something that’s broken. Jeff continues this interview emphasizing where innovation really comes, encouraging others to believe in the 20/80 rule of innovation, which are the conflicting ideas of trying to make something better. Here’s why: Imagine if you threw a bell curve, and at one end of the bell curve you have a crisis; thing about people when they get into crisis you know, they get a problem drinking, they lose their job, or they get a divorce. Why would people change when they’re in crisis? And the answer is simple, because the reward of staying where you’re at and the risk of trying something radical new is reversed. Now that’s not just true for individuals. Now, think back to 1997, Apple was trading below $5 a share. The Wall Street Journal said Apple was dead. The same is true for people, the same is true for small companies, the same is true for big companies, right. Innovation moves from the outside in, not from the inside out, so now we’ve got self-thought rising behavior in a few individuals, gaining momentum. We’re launching from the outside in, where resistance is going to be lower, and finally, you wanna fail earlier. You wanna fail often and you wanna fail off Broadway. Learn more about innovation and how organizations are succeeding using this by listening to Jeff’s interview Speaking of Wealth Show.